Several works from 22 local artists of all disciplines will be on display in the coming weeks as the Gallery at Elm Street, a newly funded art space in the First Parish in Malden, is preparing to open its first exhibit titled "MALDEN contemporary." The exhibit, curated by local artist Sand T will feature contemporary sculptures, paintings, photography and video art as part of what the parish and the Malden Arts Council expects to be a permanent gallery at the building, located at 2 Elm St., next to the Beebe School. The gallery is expected to open Sept. 9. "This has been in the works since 2003 when the Rev. David Horst (of First Parish in Malden) came to me looking to open a gallery in his building," said Sand T. "It was a few years in the making, but I began to look at the rooms in the parish to see which would be best for a gallery, and I started talking to David about what we should do and how to apply for the grant from the Malden Arts Council. We applied, received the grant and we began planning this exhibit in May of 2006." Sand T, who has been a part of the Malden arts community for nearly 6 years, began to put together the "MALDEN contemporary" exhibit, using her connections with local artists to find the pieces that fit what she was trying to accomplish. Some of the local artists involved are Stephanie Mahan Stigliano, I.M. Dedd, Wesley Kallock, Chuck Stigliano and Kelvy Bird, among others. Many of the artists are also involved in the upcoming Window Arts Malden project, an anchor project for the Malden Cultural Council that features local artist’s work displayed in downtown storefronts. "The artistic face of Malden has changed quite a bit over the last six years," said Sand T. "On account of the city’s commitment to promoting the arts, and the many galleries that have opened up, I think that Malden has gained a lot of attention as a place for artists to come show their work." The decision to place a gallery in the parish came from Horst himself, who felt that a gallery could be used to strengthen the bond between the church and the community. "Art and music are a very big part of how we worship here, and we are a very liberal parish, so I felt like a gallery in our building was very appropriate for what we wanted to do," he said. "We got in contact with Sand T, who is just a powerhouse in the art community, and we are blessed to have her. She helped us out very much with the grant from the MCC, and she has been tirelessly working on putting everything together for us." Horst hopes the exhibit, located in its common room near the rear of the building, will bring the community back to the parish year round to view the constantly changing gallery. "The ’MALDEN contemporary’ exhibit is going to show until about November, but we are hoping to keep people coming back to the gallery year round. It is going to be changing constantly," he said. 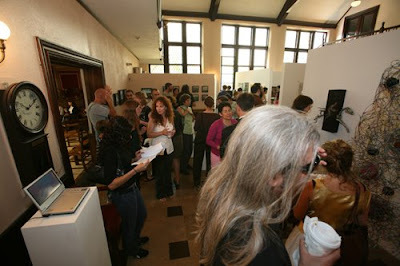 "We are looking for a group to organize an additional exhibition in the spring. We are reaching out to every Malden artist for this." The parish is looking at art as a way to also get their message across to the community, that it is good to ask questions about life and art, and that their parish, albeit a small organization, is doing that on a very high level. "The number one thing that we are trying to accomplish is to open the doors for people to talk. We are aiming to grow as much as possible so that we can become the liberal voice of religion and belief," he said. "This is not just a Jewish or Christian thing, but it is everyone all over the world. We are asking the same questions that everyone else is asking about existence and meaning and how art ties in to all of that." Although the parish community is very involved and enthusiastic with the exhibit, Sand T has made all of the decisions. "We trust her to put together the exhibit and I know she is doing a fantastic job with it," Horst said. "I am completely hands off with the choosing of the art, the only thing that I have asked is that it remain exclusively Malden artists for this exhibit, and we have had plenty of entries from artists in town, so it has been great." The Gallery at Elm Street will open its doors for this premiere exhibit on Sept. 9, and it will run through Nov. 12, with an artist’s reception on Sept. 10, from 12 noon to 3 p.m. The gallery hours are Tuesday and Friday, 10 a.m.-1 p.m., Saturday 10, a.m.- 2p.m. and Sunday, 10 a.m.-1 p.m.